Graphic designers in the pre-information age only had limited options in converting their abilities and products into financial fruition. They had to have good talent in drawing and get postgraduate degrees to get a decent job that deals with sharp tools and chemicals. Suddenly, everything changed as the computer era arrived. Now designers can earn a living without having any inborn talents or even undergraduate degrees. As long as you have a computer with internet connection and the will to learn specialized skills, you’re good to go! Today’s digital age is truly a great time for graphic designers. It holds a lot of opportunities that can be converted to well-earned money. But it won’t be that easy with a lot of competition out there. In order to pull through, you need to be proactive in finding ways to stay profitable. Here we will share some avenues where graphic designers can earn money online. We will also discuss some tips and advices on how to succeed in each of them. Selling web themes is one of the most popular ways in making money online; almost all of the pro designers have at least one theme for sale. In fact, there have been a lot of designers who had good chunk of money just by selling themes. Aside from its profit potential, this is also a perfect avenue for those who are not having a good time in finding and retaining clients (which are sometimes the designer’s worst nightmare). Furthermore, there are a lot of marketplaces where you can sell your themes. 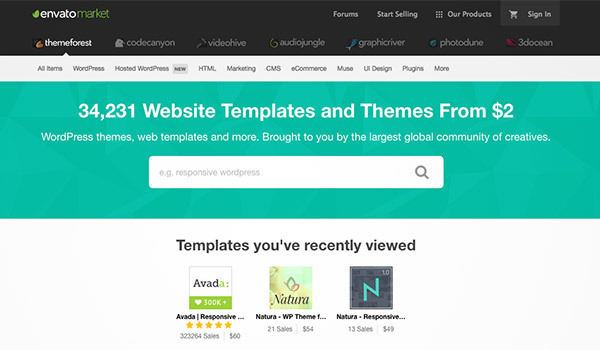 There are a lot of marketplaces online that let you sell your themes or templates. Here are some of the most reputable stores you can sign up for. ThemeForest is one of network sites powered by Envato, which was founded in 2006. ThemeForest is currently the most popular marketplace to buy and sell HTML web templates and WordPress themes. It also caters other popular CMS products such as Joomla and Drupal themes. It currently has a community of 8million members and continually growing, which means a huge pool of potential buyers. Of course, there are also some cons. For one thing, competition is undeniable and for another the author fees are a bit high. With its fixed 20% buyer fee plus a variable seller fee, you can expect to earn 50%-70% of the sales as an exclusive author or a fixed 36% as a non-exclusive author. Also, getting your theme approved can be tricky as well. As they strive to offer high quality themes, they can be strict in deciding whether to accept your work or not. If not accepted, you may either get a soft rejection (almost great but needs some small changes) or a hard rejection, which means it did not meet their minimum requirements at all. Considering the negative and the positive, ThemeForest is still a great platform to sell your themes and templates for profit. Though the cons can be daunting, they are worth the trouble due to one thing – large number of buyers. This one reason is good enough for you to get good profit. 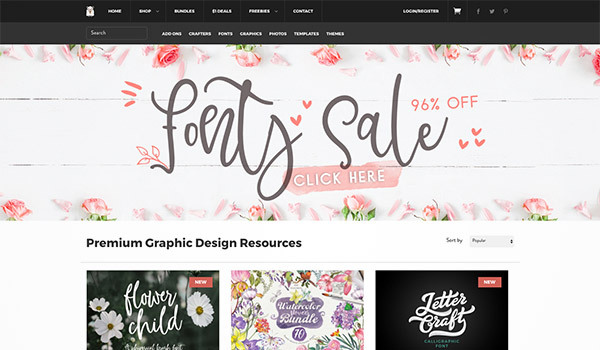 Creative Market is a relatively new marketplace that started on 2011. As of writing, it already has 3.1million members and growing. Aside from templates and themes, this platform also offers other products such as stock photos and various graphic assets. 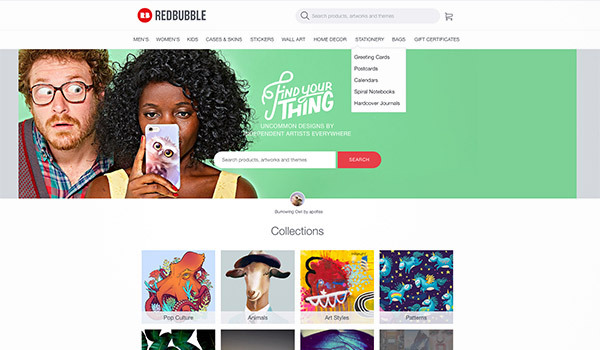 The good thing about Creative Market, aside from its good traffic, is that sellers can set their own price for their products and get 70% when purchased; you can add your themes and templates for free; and there are no exclusivity limitations. However, the review process for applying to be a seller in Creative Market can be strict. They will first examine your works’ quality and then decide if you can join their market and community. On the bright side, once you get their approval you’re already free to upload all of your products without worrying for review processes anymore. Another drawback is their payout plan where you get your requested payout every 15th of the month. If you’re in need of the money before that date, it can be a problem. Overall, the pros for Creative Market overcome its cons. In addition, the community and support staff in this platform is very friendly and helpful. Tip #1 – Do Some Research. 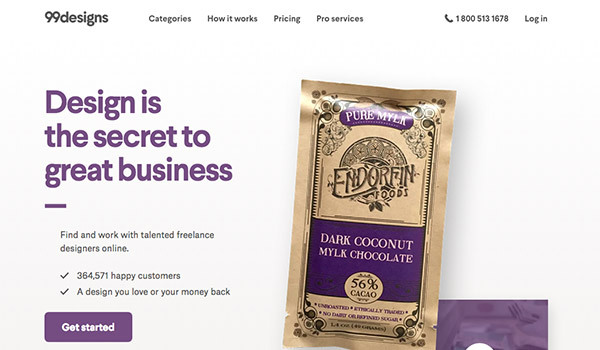 Before you start creating your premium theme, do due diligence on significant factors such as what categories and niches are in demand, who your ideal customers would be and what are their needs, what are the current trends in web design, etc. Doing this will guide you to a right path and also give you a jumpstart in selling your first theme/templates. Tip #2 – Be Involved with the community. You’ll be surprised on how much you can learn by interacting with other members in your platform’s community. Just by reading their forum and joining group chats, you can get some ideas on what trends are currently or going to be hot, the ins and outs of the marketplace, and discover helpful tips to sell your products more effectively. Blogging as a graphic designer may be one of the best things you can do in the long run. Though it’s more of a ‘delayed gratification’ approach since it takes a long time before you see some results, it has a lot of upsides that can make you a lot better as an individual and, in turn, can be converted into good personal and financial gains. 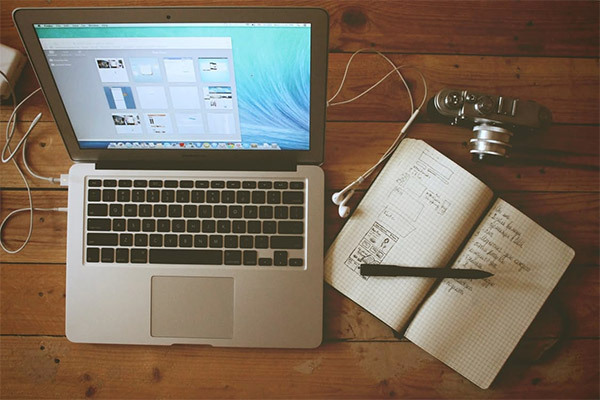 There are a lot of advantages in graphic designer blogs. Here are few more. Building your own design blog is probably one of the best ways to get yourself more popular and make you seem more pro. It allows you to share your work and expertise to others, which can be a foundation to build your brand and credibility. As long as you create good contents and avoid bad practices , sooner or later, you’ll more likely get the attention of potential clients and employers from design firms who’d want to work with you. Once you get a decent amount of traffic to your blog, you can monetize this through selling your own products and utilizing website ads. Having a lot of traffic means you can market your services and products to more potential clients and buyers. Being a freelance graphic designer today may not require any bachelor degrees, but you’ll sure need a design portfolio if you want to get ahead. Having a blog with a good amount of audience can help boost your portfolio exposure in Google and other search engine sites. 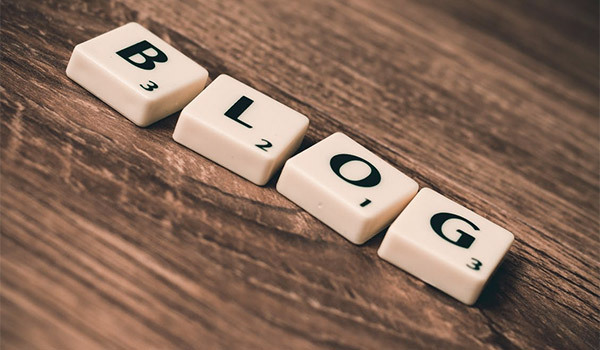 The disadvantage of blogging as a financial resource is it would take a lot of your time and energy to make your blog an authority and gather as much visitors as you can. Remember, monetizing your blog will only work if you’ve gained and maintained reputation and a lot of followers along the way. 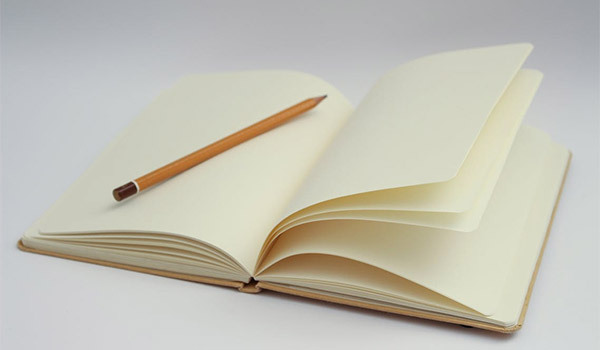 When you have decided to make your own blog, the next agenda to tackle is what blog platform to use. This is important because it can definitely affect both you and your readers’ blogging experience. There are quite a lot of choices out there, each having pros and cons. We will discuss some of the most popular platforms to help you have a better perspective on which to choose. 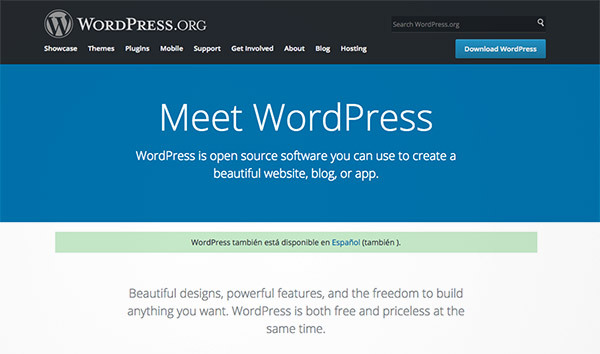 WordPress.org is an open source (its source code is open to everyone) software platform that enables anyone to build his or her own blog. This is the most popular blogging platform by far. Back in 2014, it already had 123million theme downloads, and it’s growing fast. It’s no wonder once you get to know some of its benefits and great features. • It’s a software that can be downloaded and used for free; user-friendly especially for beginners who are just starting to make a blog. 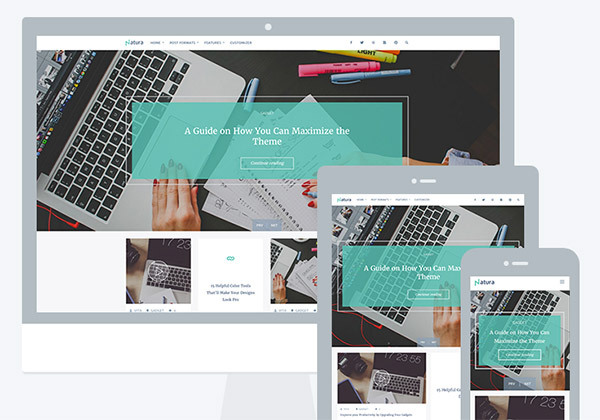 • You get full control of how your blog/website will look like. You can add extra features such as forums, memberships, etc. • You can use plugins (45,000+ free plugins available) and custom themes to make your blog unique from others. • You can monetize by adding your own ads to your blog. • Its themes are mobile-friendly. • Since web hosting is not included, you’ll need to find an adequate web hosting. This may cost $3 to $9 per month (price may increase as your blog grows), but you can cover the cost by the profit you can generate from the blog. • You need to update your WordPress version and backup your content manually. But then again, you only need to click the update button so who cares. In the backup problem, there are plugins, free and premium, that can do this for you. • It is free to sign up for an account and also easy to use. • They include free web hosting for up to 3GB space. This means you won’t need to pay for any web hosting services as long as you don’t use up more than 3GB of space. • They will do regular backup of your content for you. • They will put their own ads on every blogs/sites that are in free plan. If you want them removed, you can upgrade your plan to at least ‘Personal’, which costs $3 per month. 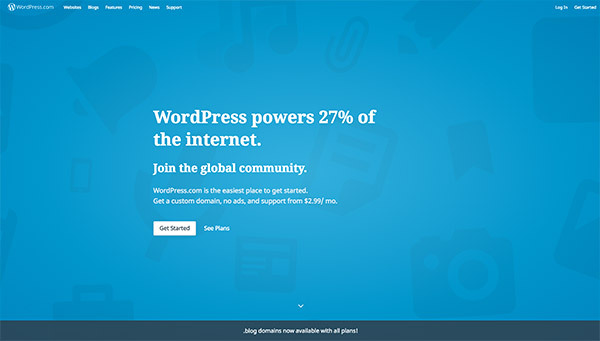 • WordPress.com only allows you limited control on your blog. One noteworthy restriction is that you are not allowed to sell ads. This significantly limits your potential in monetizing your blog. This feature will only be available once you upgrade to their ‘Premium’ or ‘Business’ plans. • You can only use themes that are available in their storehouse, which means you have to use themes that are also being used by other blogs/websites. In other words, your blog won’t be aesthetically unique. Again, this feature is only available for ‘Premium’ and ‘Business’ plans. • You’re not allowed to use plugins. This can affect the flexibility of your blog and hinder some helpful features as well. Wix is a growing hosted website platform that allows their users to build their own website/blogs through drag & drop tools. It follows a freemium model that offers both free and premium options to its members. • Free sign up that includes most helpful features. Setting up your blog is very user-friendly. • Web hosting is included. You won’t have to pay extra bucks to put your blog online. • You can build your website/blog yourself with their innovative drag & drop tools. No need to learn codding. • Great customer support. Since all of the foundation in building their website come from them, they can help you better when a problem occurs. 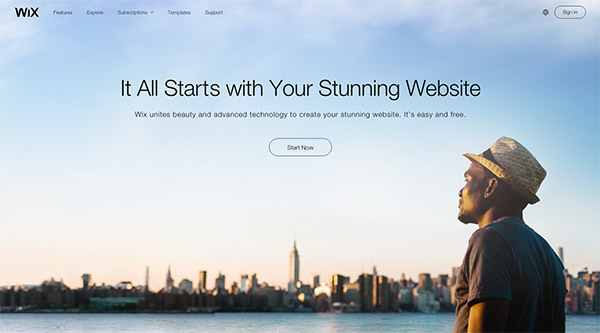 • Blogs and websites that are under their free plan will display Wix’s ads. Even their next cheapest plan at $4.50 per month will still display them. You’ll need to purchase at least their ‘Combo’ plan at $8.50/month to remove them from your site. • You cannot change your initial template. Once you have picked a template, that’s the one you’ll be using permanently. This means the template only – you can still change its design. • Each of these platforms has its pros and cons that make it difficult to decide which one to use. To narrow things down, make a list of what you want and don’t want for your blog and compare them to this list to get a good idea. Tip #1 – Continuously create fresh content. Search engines want to offer their audience relevant and up-to-date contents. With that in mind, make it a habit to bring fresh and relevant contents that aims to please your visitors and, in turn, Google. Over time, you’ll become the ‘go-to’ resource for design contents. Tip #2 – Connect with your readers. Blogging usually involves comments and other social media platforms that let’s you interact with your visitors – use it! 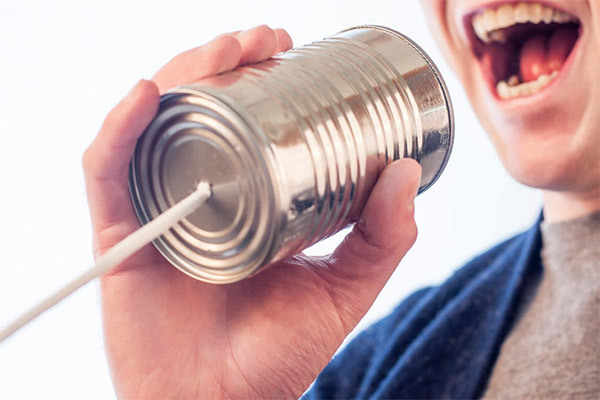 Make it a habit to respond to your visitors’ comments and remarks. A simple response like ‘Thank You’ and ‘How are you?’ can go a long way than you think. 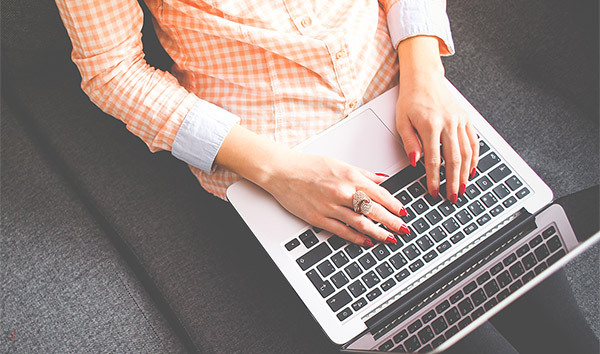 Tip #3 – Optimize your blog. Optimizing your blog for search engines is also of utmost importance. It is essential to have a good visibility on search engines in order to increase your organic traffic. There are a lot of articles that tackles about SEO. Take time to read them and learn how you can improve your blog to get more prominence on search engines like Google. Moreover, you wouldn’t want to have a slow loading time for your blog pages. Aside from your readers hating it, it would also affect your SEO ranking, which would cause a loss of your traffic. Do some steps in improving your speed such as choosing a reliable host, maintaining neat coding and scripts, removing unnecessary plugins, etc. Affiliate Marketing is considered to be a rapidly growing online marketing technique that offers lucrative earnings especially to those who have blogs or other popular social media accounts. As discussed earlier, owning a blog that could generate good contents and attract substantial visitors can get you good financial results. You can leverage this by using Affiliate Marketing. In a nutshell, Affiliate Marketing is a type of online marketing that offers commissions to those who successfully promote or sell others’ products. The Merchant (aka ‘retailer’, ‘vendor’, or ‘brand’). This refers to the creator of the product. It may range from a big company to a single individual. The Affiliate Marketer (aka ‘publisher’). This is the one that promotes the Merchants’ products. This is who you’re going to be. The products that you’ll promote will depend on what you like or what is relevant to your niche. The Customer. Obviously, these are the ones whom you promote the products to. For your blog, this would be your readers/visitors. The Network. This is a website platform that connects the Merchants and the Affiliate Marketers. While some marketers don’t use networks, I feel this is an essential avenue to start since it provides products and services that you can choose from in a wide variety. As you sign-up as an affiliate, you’ll get your own unique Affiliate Link, which will serve as your ‘tracking ID’. You can use this link to your blog posts, emails, and other social media platforms. Every time someone goes through that link, they will be referred to the retailer’s website, and because of that link they will recognize that the visitor came from you. If that visitor proceeds to buy their product, then you’ll get a commission of the sale. PPC ‘Pay per Click’. PPC is the most popular type of Affiliate Marketing. In simple words, you’ll get paid every time a visitor clicks through a merchant’s banner or their ads. It sounds easy, that’s why the commissions for this type are small – not exceeding a dollar per click, generally. CPA ‘Cost Per Action’. In this type, you’ll get paid when a visitor has completed a certain action such as signing up for an account, filling a form, purchasing an item, etc. Affiliates Marketers are usually paid in commission basis (percentage of total sales) while others receive a fixed price. It all depends on what is preferred by the retailer. Tip #1 – Choose the product that you believe in. This seems obvious to hear, but, not actually that obvious in practice. 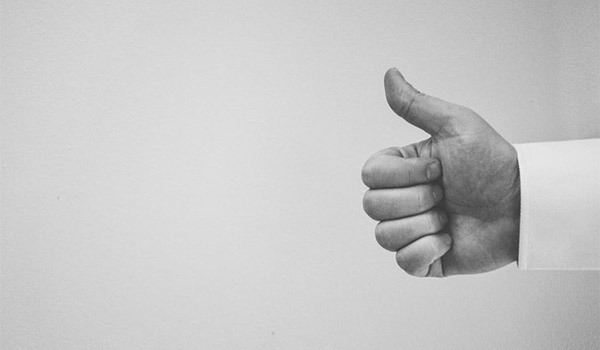 The idea to this is simple – if you truly believe on a product, you’ll not have a hard time sharing and promoting it to everyone else; you may even enjoy giving a review to it just for the sake that it’s true. Likewise, it will also help you maintain your trustworthiness to your readers. Tip #2 – Prepare your traffic on what to expect. One of the downsides of using ads and links in Affiliate Marketing is feeling confused or misled after clicking the link. You wouldn’t want that for your audience. To prevent this, prepare your readers on what they will see next; show them visual components of the merchant’s website if you’re using a linked image, inform them of all the fees ahead of time – go the extra mile in making your readers feel they know where they’re going. Design contests have been a topic in ethical debates, but whether it’s ethically sound or not, it’s still undeniable that it serves as a viable avenue for profit to graphic designers – especially for those who are just beginning their career online. The prizes for these contest range from $50 to as high as $7,000, depending on what task is required. The tasks will vary from amateur-friendly designing of banner ads to more challenging ones such as branding and rebranding of social media pages and websites. The good news is there is always something available for any level of expertise. The bad news is the competition will be fierce as you’ll be contending with other designers. To come out on top, you’ll need to bring your A-game to impress the judges and prove to them that your design is the best. A word of advice, if you decide to join design contests, you’ll need to have a tough stomach to endure rejections and loss. Remember that if you don’t get picked as the winner, the design you’ve worked for will go unpaid. 99Designs started in 2008 and now boasts 360,000+ customers and more than a million designers from around the world. It is currently the most popular website for design contests with a total of 220,000+ finished and 800+ open contests, as of date of writing. 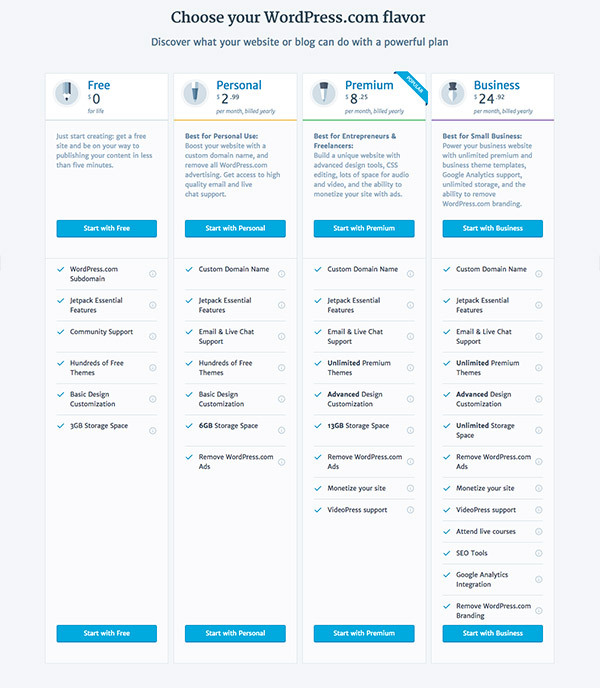 First things first, you need to sign-up for an account. You can do so by clicking the ‘Log in’ button at top right of the page, then click on the ‘Sign up’ link below the orange button to redirect you to the Sign up page. Here you can type in your email address and your preferred password. 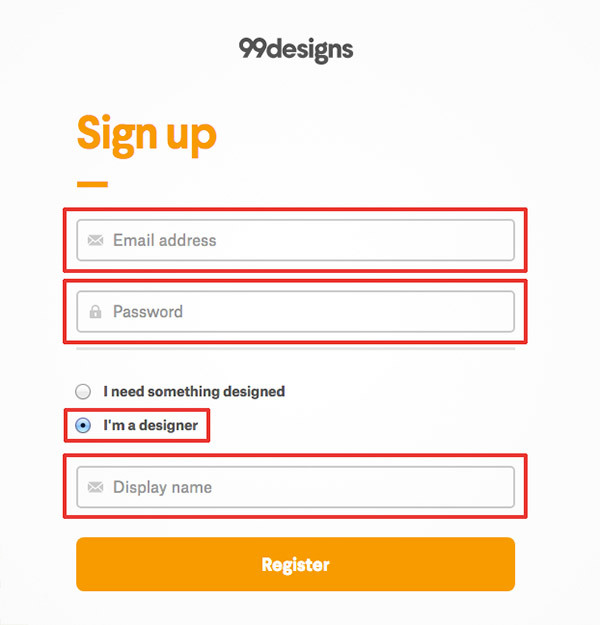 Be sure to pick the “I’m a designer” option. To join their contests, they will initially verify your identity either by taking a picture of you and one of these documents – passport, ID, & driver’s license, or uploading them online. After which, you’re good to go! If you’re fortunate to be picked as a winner, you’ll get 100% of the prize money. 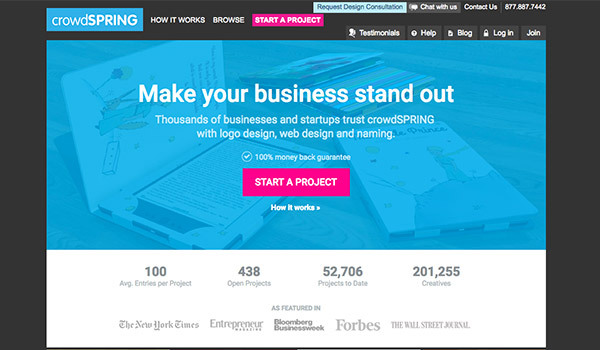 Crowdspring is a similar platform to 99Deisgns. Since its creation in 2007, the platform has accumulated contests and designers with a total of 50,000+ and 200,000, respectively. Their business model can be closely compared to the former platform wherein a client will start a ‘project’ (that’s what they call their contest), designers will submit their design entries, then the client will pick the best to be the winner. You can join various categories such as logo design, business cards, clothing, package graphics, book covers, and web & mobile designs. Tip #1 – Pick the most favorable contest available. Before anything else, join a contest where you have more odds on your side. Make sure that the contest you join is ‘Guaranteed’ or ‘Assured’ – this means that the client will award a winner no matter what. Moreover, Join contests with the least amount of design entries. You’ll have a better chance of getting a profit by joining contests with only few competitors rather than going for those higher rewards but with high number of participants as well. Tip #2 – Read the design brief, and then read it again. If the contest were a crossword puzzle, then the brief would be your clues. To solve the clients’ problem, you need to know what they need; and you will find it in the brief that they’ve made. So read them carefully before you start, read them again when you’re stuck, and read them again before you submit. Now, there are times that briefs provided are incomplete in information. You can fill these gaps by doing your own research about their company. Search them on Google. Gather the data that will give you an additional insight on what the client need and apply them to your design. Tip #3 – Communicate with the contest holder. After submitting your entry, try to open up a communication with the contest holder. This will allow you to explain your design as well as gather more info on what they want to see on the design that were not included in the brief. Selling stock graphics is one of the most common ways graphic designers earn money online. If you have some unused graphic assets including fonts, textures, illustrations, logo designs, vector arts, icons, etc., you can always sell some of them. Keep in mind that if it’s downloadable, then it’s sellable. Aside from the potential of earning money, your credibility and skills can also improve. If you have shops in various marketplaces and your assets get decent sales, you can gain more visibility and eventually get the approval from your design community. 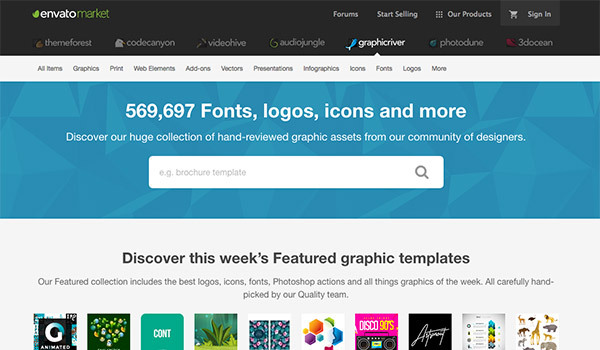 GraphicRiver is another network site of Envato Market that was launched in 2009. It is a dedicated market for graphic assets and now holds 560,000+ items for sale. Similar to ThemeForest, your submitted file or design will first go through a review process where a reviewer of Envato will examine your work for approval. Once accepted, you can decide on the price of your item (aka author-drive pricing) while Envato will add their own buyer fee. 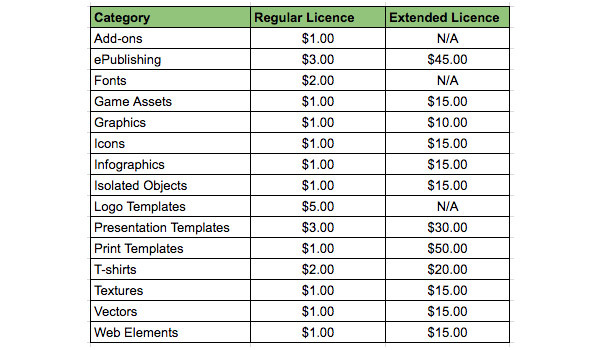 You can check their fixed buyer fees for GraphicRiver below. Additionally, when you have sold an item, you get the item price, minus author fee (55% for non-exclusive author and 12.5%-37.5% for exclusive author. 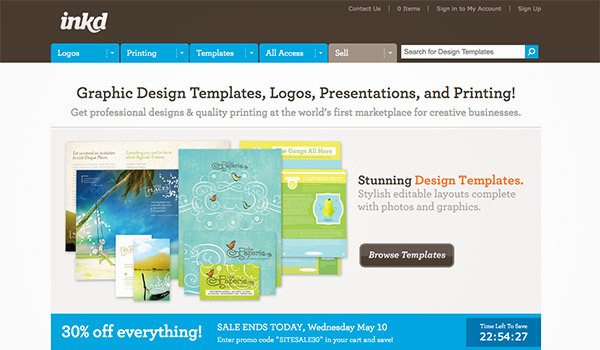 Inkd is another possible marketplace you can sell your business card designs, brochures, menus, and other print designs. The platform was launched in 2009 with only 800 templates. Now they have products near to 2,000. The process in submitting your work is similar to GraphicRiver wherein your submission will be reviewed by their staff for quality check. The only difference is that in Inkd, you’ll need to base your design with their own templates, which you can download from their site. This may sound a restriction for you, but on the contrary, it can be an advantage since it help you speed up your design process with its ready-made boarders and dimensions. It covers a lot of items such as brochure & flyer templates, letterhead templates, business card templates, etc., so you have a good variation to choose from. Once your designs are accepted for listing and you’re able to sell them, you’ll get 20% royalty of the total sales (tax not included). Currently, they don’t have any restrictions for exclusivity yet. But by the time it’s implemented, the designer’s share of the revenue will increase. Here is a more obvious option, use your own blog or website to sell your products! This way, you won’t have to worry in competing with other designers. Plus, you don’t have to pay for any fees either – you’ll get 100 percent of the profit. However, as I’ve said earlier, this will only work well if you have a good amount of audience/followers to your site. So you’d need to build on that traffic first before you can pull this gig off. Tip #1 – Know the demands. There are virtually limitless kinds of products that you can create, but only a few of them will sell. Recognize the ones that are currently in demand and focus your time and skills in making them to make your odds in selling much better. You can visit the design marketplaces mentioned earlier and checkout which items are sold like hotcakes. Also check other design community platforms like Behance and Dribbble to see designs that are in trend. This will broaden your design awareness and keep you up to date with the trends. Tip #2 – Bundle them up. Make your products more attractive to customers by grouping them up in a bundle and selling them with a discount. This is an effective marketing strategy that can dramatically increase your sales. In deciding on what to put in a bundle, think of what the buyer will most likely need. You can bundle up similar assets such as textures and patterns, or you can do a mix up of fonts, mockups, and background images, which are commonly necessary for print bundles. Maybe you can also make a theme for a bundle such as a ‘vintage bundles’ that includes vintage fonts, vintage vectors, vintage logos, etc. This is a bit obvious avenue nowadays. If you have great skills and a decent amount of experience, you can try your hand at freelance jobs. This is another way to get your presence and personal brand out there. With its skyrocketing popularity, it is now usually classified into these five types. 1. The Independent Contractor. These freelancers do contract work on a per-project basis; e.g. a graphic designer who was contracted to create a package design for a product. 2. The Moonlighter. They are the ones who have regular, usually daytime, jobs while also doing other work on their spare time to supplement their income; e.g. a full-time graphic designer at a firm by day and a freelance logo designer by night. 3. Diversified Workers. They do a combination of traditional job and freelance work; e.g. part-time graphic designer at a firm and part-time freelance writer. 4. Temporary Workers. They are individuals who work with a client or contractor for a limited time only; e.g. being a design consultant for a 3-month project. 5. Freelance Business Owner. This is an individual who consider himself/herself a freelancer but has a few (1-5) employees; e.g. a freelance proofreader hiring other proofreaders to meet demands. If you’re a night owl like me, getting up early in the morning for that 9 to 5 job is always a struggle. Freelancing is a different story. You can get up and start working whenever you are at your best hours, remember that time management is key. Since you’re in charge in what task to accept or not, you’re in control of your own workload. You won’t need to split yourself into two just to finish a lot of work at once. You can focus on what you’re currently doing and later on add new ones, at your own pace. You can work wherever you want. Most people would wish to work in their homes instead of an office cubicle; most freelancers do just that. As long as laptops are allowed and internet connection is available, freelancers can work anywhere – coffee shops, libraries, local parks, etc. Theoretically speaking, you can earn a lot more in freelancing than a typical 9 to 5 desk job, which has a capped salary. This will all depend on your productivity and performance. Furthermore, you can rightfully charge what your work is worth. Since freelancers are considered self-employed workers, they can avail tax deductions on business-related expenses such as computer and other equipment for your home office, business travels, internet access, etc. Adding these all up will help you save a considerable amount of money when tax day comes. Having a consistent income is one of the hardest obstacles in freelancing, especially for beginners. Unlike regular employees who can expect on getting a steady paycheck, freelancers may have to wait a longer time to get their income. This can be a problem if due dates for the bills are near. Freelancers don’t have the comfort of having their insurances covered by a company. It’s all on you in finding your own coverage and paying for them. Furthermore, once you get sick or travel for a vacation, you basically stop generating income. There will be no ‘leave with pay’ benefits to fall back on. Being a freelancer also means you are responsible for a lot of things such as keeping track of billings and other expenses, licensing, handling broken computers, promoting and marketing yourself, and finding new clients, to say a few. These activities, sadly, are non-billable ones for a freelancer. 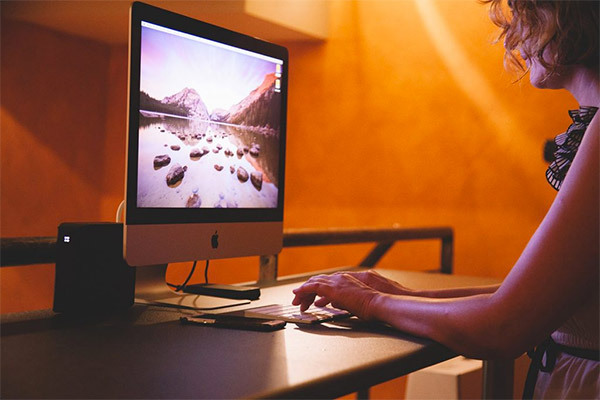 If you’ve read these pros and cons and feel that this will work for you, then here are some of the most popular freelance websites that can help you start your freelancing career and land some new clients. 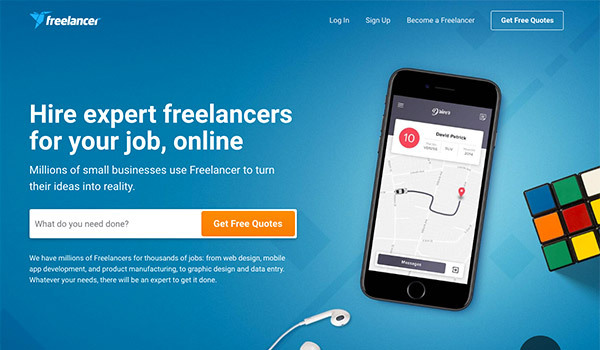 Freelancer is a freelancing marketplace that was created in 2009. It is considered as one of the largest in terms of quantity of members and projects. In this website, employers can either use a contest method where designers will submit their design ideas and the employer can choose a winner, or hire a freelancer through a bidding method where freelancers place their bid amount for a specific project. You are free to join any of these methods. You can publicly see the posted projects but you’ll need to have an account in order to submit your bid. It’s fairly easy to sign up – you can either do it with your Facebook account or your email account. Be sure to fill out your profile page to make you look more legit to employers and get a better chance of getting picked. One of the big advantages of Freelancer.com is it has a large number of projects listings that you can bid on. Just keep in mind that unlike other similar websites, Freelancer.com’s bid ranking will depend on your feedback on a specific category instead of chronological order. For example, if you have a lot of 5-star feedbacks on your web design projects but none on your graphic design works, chances are you’ll rank top on the bidding list for web design tasks and place bottom for graphic design biddings. Also, they have a ‘Milestone Payment’ where large projects can be broken up into smaller ‘milestones’, which are agreed upon by both parties. As each milestone is met, the client will pay the freelancer its corresponding fee. Freelancer.com offers significant advantages for those who are into freelancing – beginners and pros. On the other side, there are also some disadvantages that can make it a no-go to others. Bidding on projects is free. If you get awarded on a fixed price project, they will charge a 10% or $5 USD introduction free, whichever is greater. If you get awarded on an hourly project, they will charge 10% whenever the employer does a payment to you. Submitting your entry to a contest is free. If you win the contest prize, they will take 10% of the total prize or $5 USD, whichever is greater. If you get hired for a service, they will take 20% fee of the total service price charged. Formerly known as Elance-oDesk, Upwork is also a freelancing platform that holds millions of freelancers. In 2016, it reported a total of $1billion of freelancer billings. 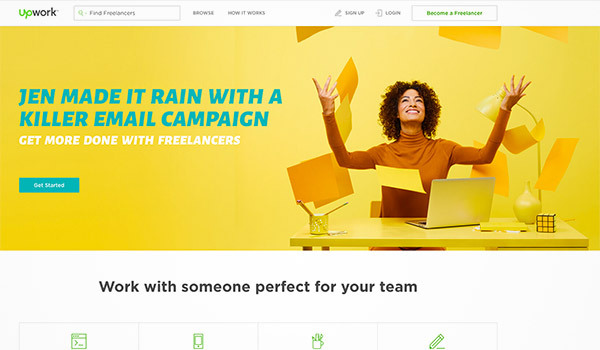 All of their projects are covered by their ‘Upwork Payment Protection’, which aims to guarantee that the freelancers are rightfully paid for their successfully completed tasks. They have an escrow service where funds from clients are placed there and used once a milestone on the project is met. They are particular in giving a satisfactory freelancer quality. They have a ‘MyStats’ page where freelancers can see some insights on their performance ratings and find ways to improve them. If a freelancer fails to produce quality service and gets several flags from various clients, he or she may be removed from the platform. For their fees, they use a ‘sliding fee’ model where fees are determined on the freelancer’s lifetime billing with a specific client. They charge 20% for the freelancer’s first $500 billing with the client; 10% for billings within $500.01 to $10,000; and 5% for lifetime billings that exceed $10,000. In simple terms, you get more earnings as you continue to work with your regular clients. Tip #1 – Before you pitch to clients, know them first. Before you bombard a client with your stellar feedbacks and proficiency, try to learn what they need first and how you can fulfill them. 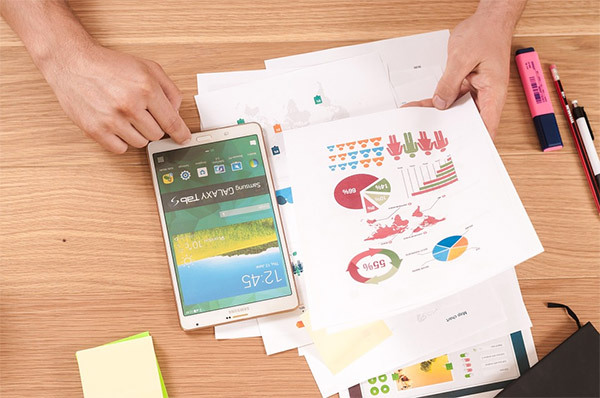 Gather information about their business, how it works, and base that knowledge on finding out how your skills can help improve their business. People are impressed to those who do their homework. This will also make your communication clearer and more fluid. In a nutshell, Pitch by showing them you understand their problem and know how you can solve them instead of just showing off your skills. Tip #2 – Branding, Branding, Branding. Always remember that when you start freelancing, you will ultimately be the product. This means you have to be very careful on how you brand yourself. You have to be clear on what you do and don’t do. This way, clients will have a good idea on what to expect in working with you. Also, you’ll be able to focus on what you do best and keep on improving in it until you become one of the best. That’s how you can rightfully justify having higher rates and eventually have clients coming to you instead of you going to them. 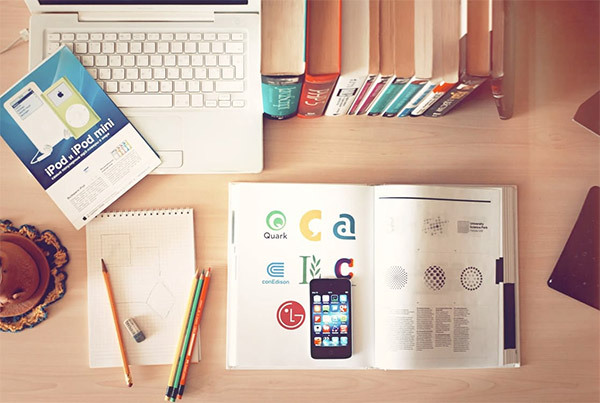 You can also earn as a graphic designer by designing print-on-demand (POD) products such as T-shirts, book covers, posters, and other related products. This avenue has been gaining more popularity lately and is becoming a worthy prospect where you can practice your skills and earn some bucks. Zazzle is an online marketplace that offers a wide variety of products. Among them are printable products such as shirts, invitations & cards, pillows, mugs, stickers, hats, smartphone cases, wall art, and a lot more. In simple terms, their business model starts with you uploading your artworks onto their product templates for free. When a customer buys them, they will handle the transactions, printing & shipping of the product, the whole customer service. After which, they will send you a royalty for the sale (you decide how much royalty percentage you want). Note: Your royalty will be added up to the base price of the product. Ergo, the higher your royalty rate, the more expensive will be the product. Aside from earning money from sales, you can also get a commission by referring other sellers’ designs. Once somebody buys their designs, you can earn a profit even though it was not your design or product. It is fairly easy to navigate through the site. You can sign up for an account and setup your shop for free in just minutes. This shop is basically a webpage hosted by Zazzle. It’s where you can display your products and designs for customers to browse. 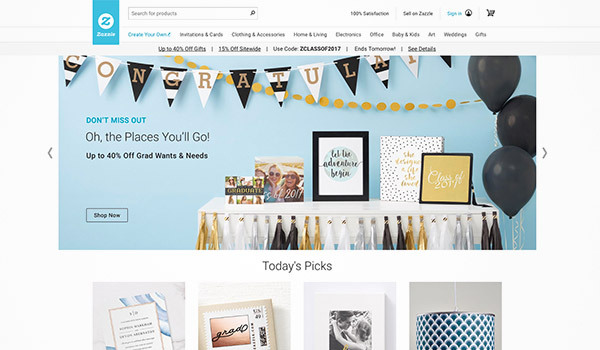 The items you place on your shop are also visible and searchable in the marketplace of Zazzle. Redbubble is also a viable marketplace for POD products. It was created in 2006 and now has a reported 10million sit visits per month. Similar to Zazzle, they also have a wide variety of products on sale. This gives you a lot of choices on what products to create and sell. This online marketplace also lets you sign up and setup a shop for free. After setting everything up, you can now upload your designs and add them to specific products. Royalty-wise, you will also decide on how much royalty rate you want for every item. Tip #1 – Once again, Branding. No matter what happens, only sell high quality designs. It may be tempting to create a lot of mediocre items and make some sales out of it, but it will be detrimental in the long run. Sooner or later, customers will avoid your shop (and you) and will go to other designers that produce more high quality designs. Tip #2 – Have a Good Visibility. You can’t buy what you can’t see. That’s why search engine visibility is important. Some think that simply uploading their design online is enough for it to be seen by millions of people, that’s not the case. You need to make it search engine-friendly so it would appear more on searches. One way to do this is to optimize your items’ keywords. Put a clear and specific title such as “Sunflower T-shirt Designs” (just randomly made it up). This way, it is easier for search engines to detect the item. It goes the same for the description. Make a specific and detailed description of the item to back up its title. It can also be helpful if you put tags to your items. This can guide search engines in determining what you’re actually selling. This next financial avenue is more relevant for graphic designers who already have decent experience or exceptional skills on designing. Here you can share your expertise for a price. It can range from traditional drawing techniques to software mastery like Photoshop and Illustrator. Having a good online training course can boost your confidence while at the same time improve your personal branding. This can give a ‘pro’ impression to those who see it and give you more authority in the world of designing. The drawback to this is that it may require video and audio editing skills. Also, editing a video usually takes up time to finish, not to mention the time you will spend in creating the courses. If you overcome this, however, you can gain another stream of passive income. Here are some popular platforms where you can create and share your courses. 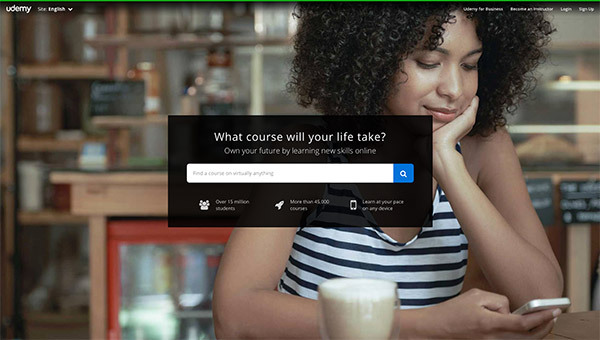 Udemy was created on 2010 and now offers 48,000 various courses to 15milion students worldwide. As of writing, there are only few courses for graphic design, which means there are still topics available to teach and less competition to worry about. To be able to sell your courses, you’ll need to fill out their Premium Instructor Application. They will ask for your personal info as well as your Paypal account where they will send your revenue. With their pricing, you can sell your courses from $20 to $200 in 5s ($20, $25, $30…). While they have price standards, you are still in control of the price of your course. Under normal circumstances, you’ll receive 50% of your total revenue. However, if you offer a ‘coupon code’ that offers discounts to the students, you may receive 97% of the net income. 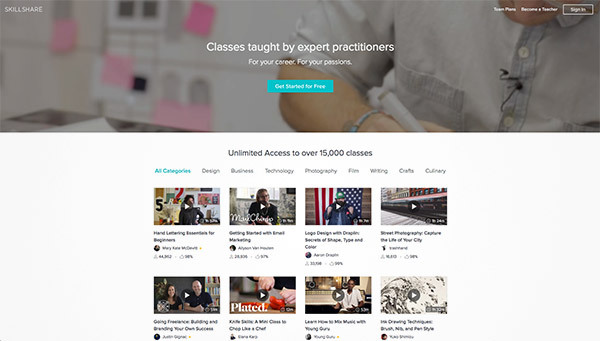 Skillshare is another great online marketplace where you can sell you courses. In this platform, you’ll have to apply and get accepted before you can share your courses. Once you’re accepted, you can start creating your courses that are required to be at least 45minutes in total and are broken down into several 4-9minute videos. They have a community for teachers where they connect and communicate with various topics. You will start to earn royalties when you “get a minimum total of 30 Premium minutes watched across all of your classes within a month”. Your total royalty will be calculated based on how many minutes premium students spent watching your class among other factors that were not disclosed by Skillshare. Tip #1- Encourage student discussions. Students can learn a lot from their fellow students by discussing the topics and interacting in project-based class. The advantage of online courses is that it is available to everyone around the globe. Utilize this advantage by encouraging your students to connect and communicate with each other. Not only will they learn more, they can have an enjoyable and unique experience in your class, which can improve your credibility and popularity. Tip #2 – Determine your audience first. Determining your target audience is essential for your course-creation process. You know this by asking yourself “To whom am I creating this course for?” Is it for the beginners? For designers with intermediate skills? Or for the professionals? If you answer this question, you can then find out what they would want to learn or master. What do they need to know in order to improve their skills and careers? This way, you can create courses that are both highly informative and relevant. Tip #3 – Do your own marketing. Most online learning platforms have promotional marketing that can help you get more traffic to your courses. Don’t stop there. Promote your courses to other social media platforms, your blog, etc. Emphasize positive testimonials from previous students, if any. These methods can improve the traffic of your courses. Though writing an e-book is not that popular for graphic designers, it’s also not unheard of to earn thousands of dollars just by selling an e-book or two. Furthermore, with the high usage of tablets and smartphones, e-books are also having a good time riding the tech wave. The best thing about e-books is that you just need to create the content once. After which, you can just let it sell for years. Having an e-book is also a great factor in building your authority as a graphic designer. The bad thing about it is you need to spend much quality time creating a great content. Not only should it be factual and informative, it should also be interesting and compelling, at most. Also, the publication process can take an effort on your side, even though it’s a lot easier nowadays. Tip #1 – Don’t rush it. As mentioned above, your e-book must be of high quality, both in design and content, for it to be attractive to customers. With that said, take as much time as you need in writing your content. Make sure you include all the necessary points and information and maybe add some relevant trivia to satisfy some curiosities. Otherwise, you won’t be able to sell it no matter how cheap the price is. Tip #2 – Put yourself in the readers’ shoes. Occasionally, we forget that our ‘knowledge base’ is different from the others. We may sometimes be very familiar to a topic that we tend to forget that others are just starting to learn them – especially for beginners. The opposite is also true for professionals, we may put a lot of information that seems too obvious to mention for them. The key to this is knowing who your target readers are. Once you’ve determined this, always consider their perspective in reading your e-book and write accordingly. This will make their reading experience more enjoyable and less confusing. Tip #3 – Keep it concise. Remember that e-books are read in computers and other devices that are not ideal for long reads. With that, try to keep your main topics free from words that do not really support them. Deliver in a clear and concise manner, but not to a point that it gets boring and monotonous. In this current era, visual content is king. Whether it is a blog post or a food gif, you’ll need to have a visually appealing element that is easy to understand for it to get attention. What’s more visually informative than infographics? Nothing. That’s why they are in demand right now. They are widely used for content, marketing, social media posts, and more. However, the demand is specifically for those with high quality work. So if you’re planning to sell infographics templates and elements, you better give it your best. Aside from other digital graphic products, GraphicRiver also sells infographics. The terms of selling them in this platform are similar to what we’ve discussed earlier on Stock Graphics. Check it out if you haven’t read it yet. 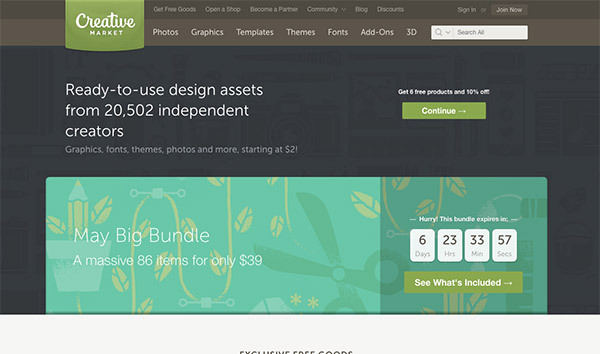 TheHungryJpeg is an online shop that offers affordable graphic assets to all designers – beginners or pro. They have a wide variety of products including fonts, software add-ons (Photoshop brushes, layer styles, etc. ), graphic templates, and yes, infographics. They also offer bundle discounts and $1 deals for various items. Though it’s still relatively new (launched in 2014), it is a great platform that allows you to open your store to sell your infographics. Here’s what’s great about this website – once you open an store and make a sale on your products, you get 70% of the income, which is a competitive royalty fee compared to its competitors. Tip #1- Concise design. Always remember that the beauty of infographics is it turns information that is usually hard to grasp into an entertaining visual that’s easier to understand. So, be sure to organize your design in a way that it has a clear and focused topic, good flow of data, and engaging elements. To make sure it is understandable, share it to your friends and colleagues first and ask for their feedback before you go on selling them. Tip #2 – Keep up with the trends. This is a bit obvious, but needs to be emphasized. To get more sales, your designs must be on par with the current trends. Observe through different marketplaces and see what infographics designs have been getting more sales in the past few weeks or months. Tip #3 – Diversify your categories. Don,t just focus on one or two categories when thinking of a design theme for infographics. There are lots to choose from including food, science & health, tech, social, corporate, etc. If possible, have at least 1 or 2 infographics in each of these areas to tap on more customers online. Overall, there are a lot ways to earn some cash online. Whatever you choose, always remember that at the end of the day, you are the product. Invest in refining your personal branding as it is a key factor in being successful in the world of internet. Improve your skills, connect and be in touch with reputable designers, strive to be the best and you’ll be handsomely rewarded in the long run. Explore these avenues with your personal branding in mind and you’ll do fine. Thank you for spending time with this article! Find more helpful articles here in NaldzGraphics!